Since my visit to Union Station in Kansas City, I’ve had a hankering for a long train ride, and when I found out that Amtrak could get me to Austin for the Dance/USA conference for less than the cost of a plane ticket I decided to go for it. You’re probably either really jealous or think I’m really ridiculous. Any subscribers will be glad to hear that this ends the whirlwind update from “that other travel blog”. Bringing you this last Starbucks Around the World from Houston means I’m up-to-date (on Starbuckses, anyway) and I won’t be clogging up your newsfeed nearly as much. Although, I have to say, it’s been so fun for me to go through all of these memories. In the end, I’m sure you realize that it’s not about the Starbucks, or the coffee. This is about experiencing the everyday life and cultures of different places around the world. It’s about what is different, and what is very much the same – such as a daily cup of coffee. I hope you’re enjoying the ride as much as I am…. Anyone who knows me well knows that I’m crazy about Texas (insert sarcasm here). Don’t get me wrong, I know a lot of nice people from Texas, but a seriously bad 48 hours in Dallas and general disdain for big hair have left me a little underwhelmed about the idea of making this state a destination spot. On the way to Oaxaca, our 30-minute stopover in Houston meant of course that we’d miss our connecting flight and end up hanging out at George Bush International Airport for 3 hours. 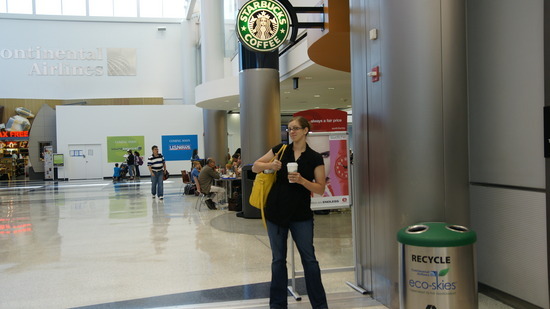 At least it gave us time to stop off for the first (and presumably only) Starbucks hit in Texas. I think it was a green tea, actually. In the end, George Bush turned out alright – the airport, anyway – and we got where we needed to go (with a surprise trip to Mexico City and an impromtu visit with Nancy’s Aunt). And according to our friend Shannon (the best thing from Texas, as far as I’m concerned), if ever there again after 10am there’s great BBQ in terminal C…. p.s. check me out with all my style points on Unstitched, a fantastically beautiful blog with a great series on traveling.